East Durham holds one of the greatest varieties of architecture in the city, from bungalows and pyramidal cottages to Victorian farmhouses and Art Deco commercial spaces . 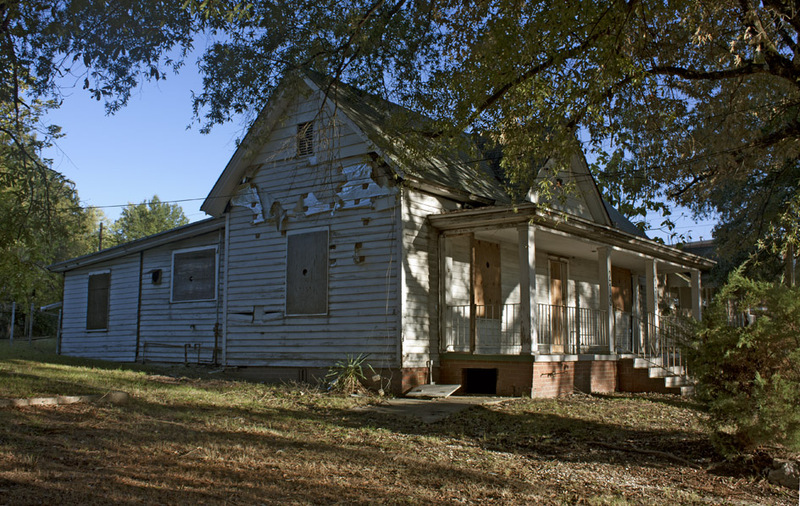 In 2009, East Durham was voted as one of The Best “Old House” Neighborhoods in the South. The neighborhood grew around the existing farmhouses, and landowners gradually sold off their land to factories and developers. While many of the rows upon rows of mill houses have been long demolished, a few beautiful examples still remain. 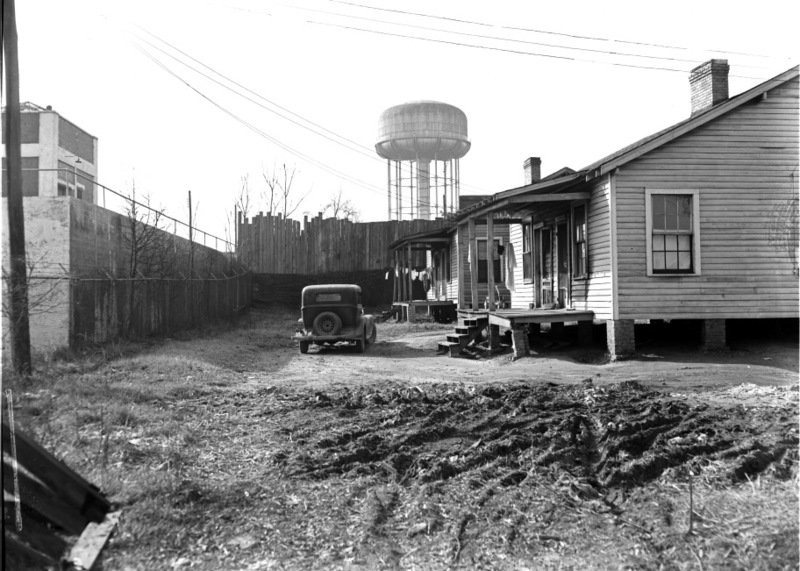 Workers' shacks lined up along muddy Morven's Alley are offset by the grandeur of the Dr. George Ross House or the beauty of the Griffin Barbee house. From the 1920s-1930s there was a second wave of homes being built to the north side of the neighborhood, where you see more Craftsmans and Tudors and later styles. 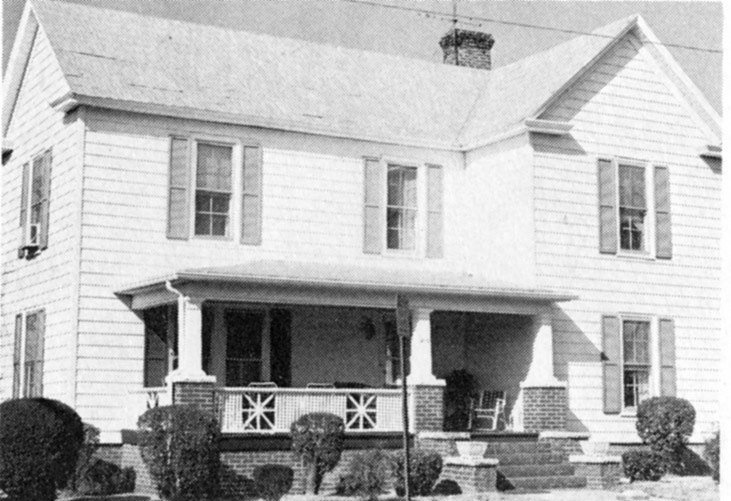 Sheriff Felix D. Markham's late 19th century farmhouse, which once encompassed land around it, developed into housing in the 1930s, gives a sense of the original development pattern of large farmsteads in the area that would become East Durham. One of the oldest houses in East Durham, 519 Park Avenue originally sat on larger parcel of land, and faced onto Lottie Street, now Liberty; the side of the house, facing Park, has been converted to the front entrance. Details imply a construction date of ~1880s. Felix D. Markham House. This large I-House actually faces Liberty Street to the north, thus presents its east side to Park Avenue. Although it is so altered that it is noncontributing, it does retain a large east gable chinmey, a front cross-gable with a peaked window. 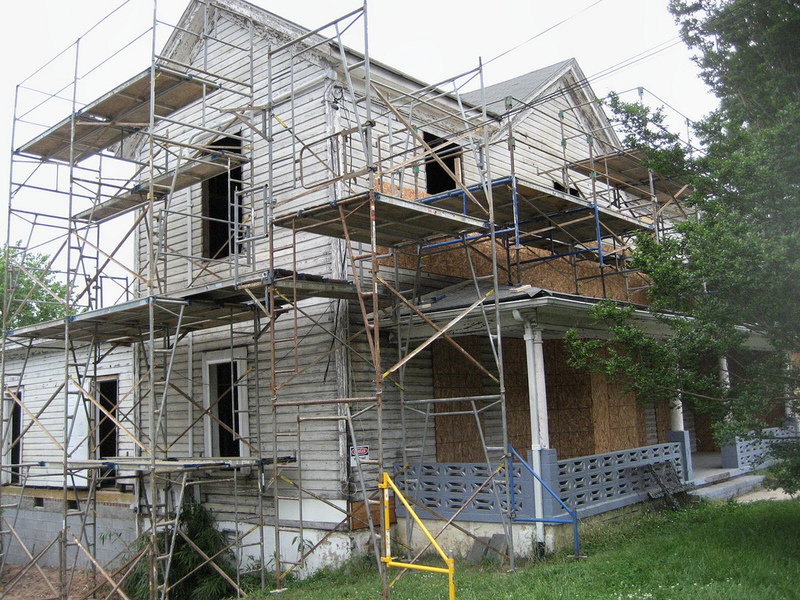 Most of the front windows and door have been removed, vinyl covers the entire house, and all sash have been replaced. A large 2-story rear addition was added to create four apartments. This appears on late 19th century Sanborn maps. The property from Liberty, Southgate, Guthrie and Driver streets was the farm of sheriff Felix D. Markham. 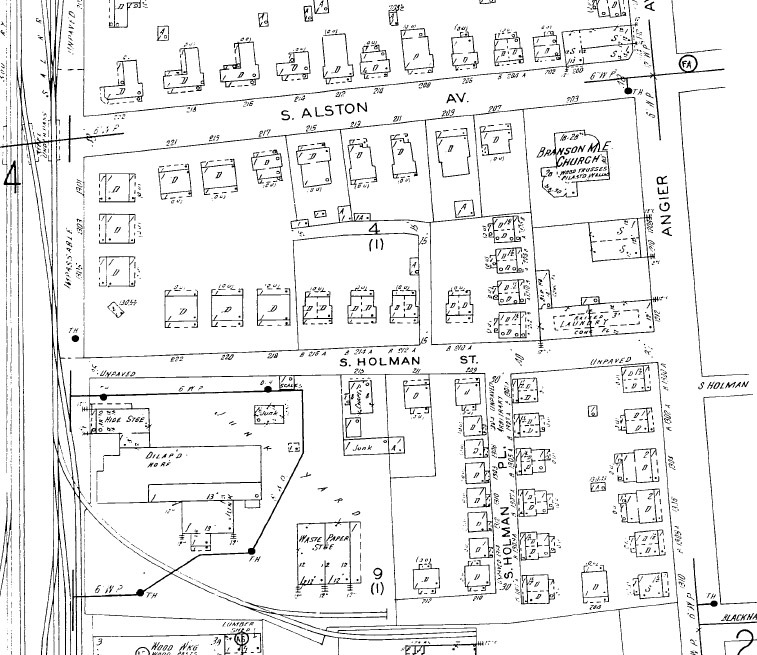 It was subdivided into lots in 1920 by the Durham Realty & Insurance Company (Plat Book 3, 111). Realtor George W. Hursey lived here in the 1920s. By 1935 it had been converted to 4 apartments. 1935-1960:4 apartments. 1937 SM: apartments. 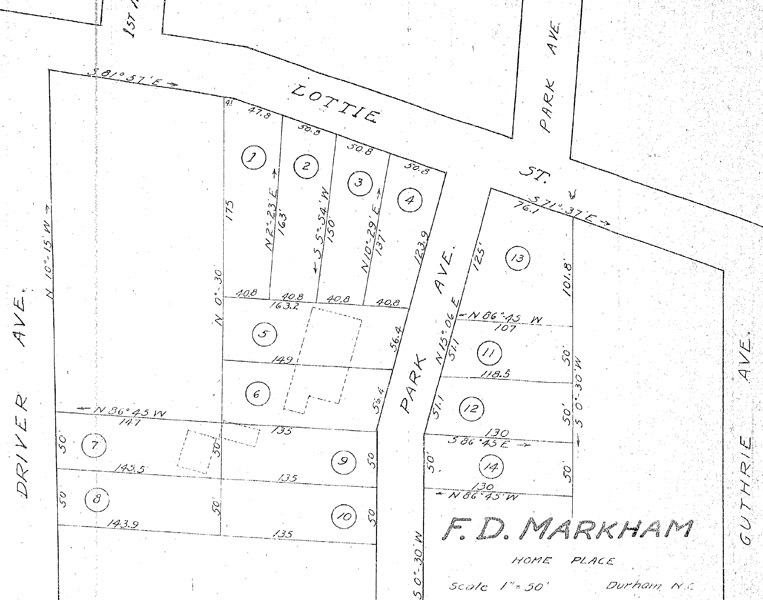 A 1923 plat denotes this as the FD Markham Homeplace, and divides the original property - through which this section of Park Avenue was cut to continue the extant, north-of-Lottie section southward - into 14 parcels. 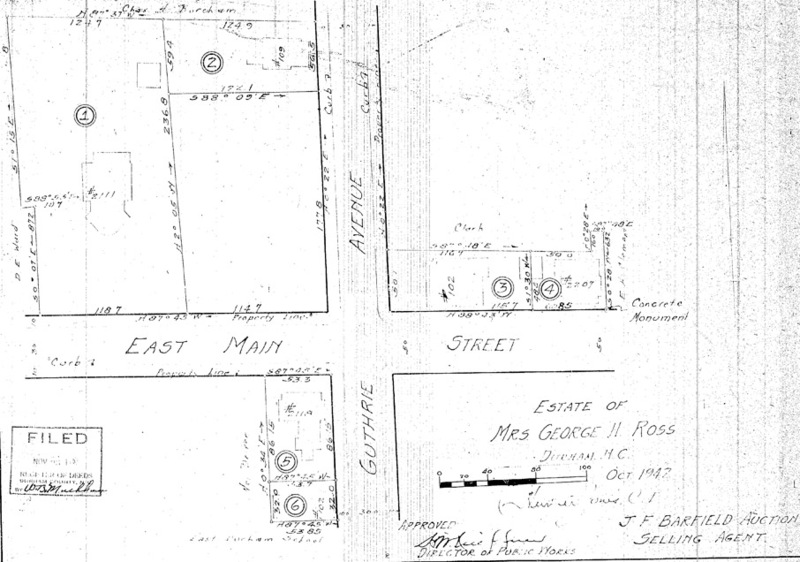 Subdivision plat, 1923, with the house and outbuilding outlines shown. 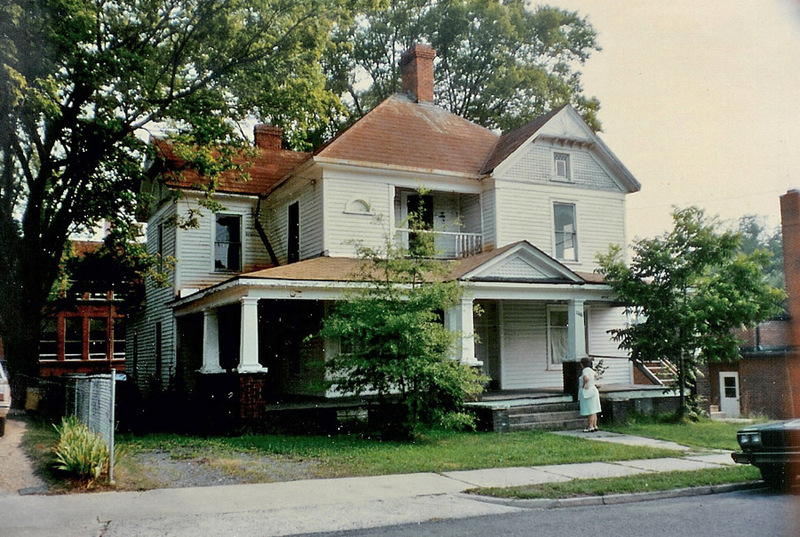 Unfortunately, time had already seen the subdivision of the original house into multiple apartments by the 1980 photo above; since then the vinylization has removed much of the original detailing of the house. 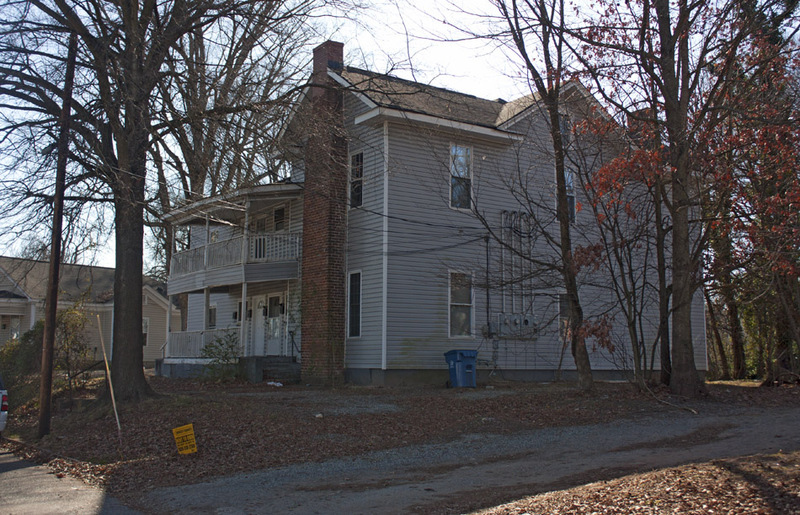 It's owned by a Raleigh investor who bought it with bunch of other properties from a similar owner of a bunch of historic rental houses in East Durham in 2005. I wouldn't be sad if all of these rental companies that own 10 or 30 or 100 historic houses in Durham went quietly into the good night and we never heard from them again. Nothing good seems to come of their ownership, except the incentive to make money off of students and impoverished people by keeping rents low, by keeping the conditions of the housing marginal-at-best, and doing the cheapest home depot repairs possible when absolutely necessary. I understand the rationale for the State Historic Preservation Office and National Park Service to consider this non-contributing, and thus ineligible for historic tax credits. It's a slippery slope in trying to hang on to a credible definition of what is historic and what isn't. The reality is that it's pretty arbitrary. Consultants may bristle against that notion, because it's a matter of pecuniary interest to them, but this house clearly still contributes to the district - and it would be wonderful incentive to someone to restore it to its original glory to have tax credits available. Historic folks fall prey to the details for fear of having their authority assailed, but really - this is a late 19th century farmhouse that sits amid 1930s structures, and gives a sense of the 'first wave' of development of this area. 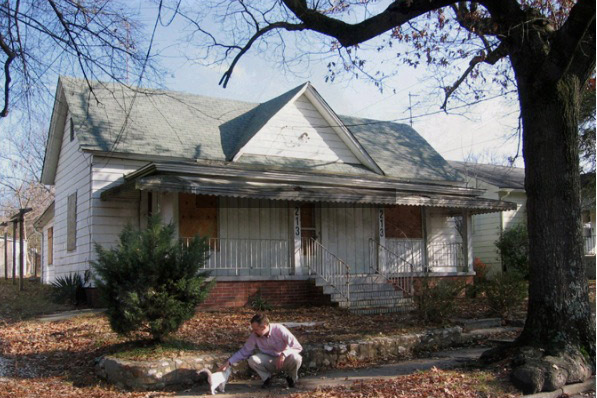 The historic district would not be diminished at all if it were demolished? Silliness. The principal stylistic elements of the two-story hip-roofed house consist of Doric columns supporting the wraparound porch and porte cochere, a Palladian window in the attic dormer on the main facade, and the pedimented gables of the shallow wings on the side elevations. Retaining its original tall chimneys and slate roof, the house is prominently situated on a very large corner lot and surrounded by mature hardwoods. The house has been remuddled a good bit since that time. It appears it came under ownership of the Agape School in 1986, so presumably the school did it. Such would seem confirmed by their recent Home Depot-esque garish remodel of the house at 1217 Holloway - otherwise known as the red-roof-you-can-see-from z=15 on Google Maps. 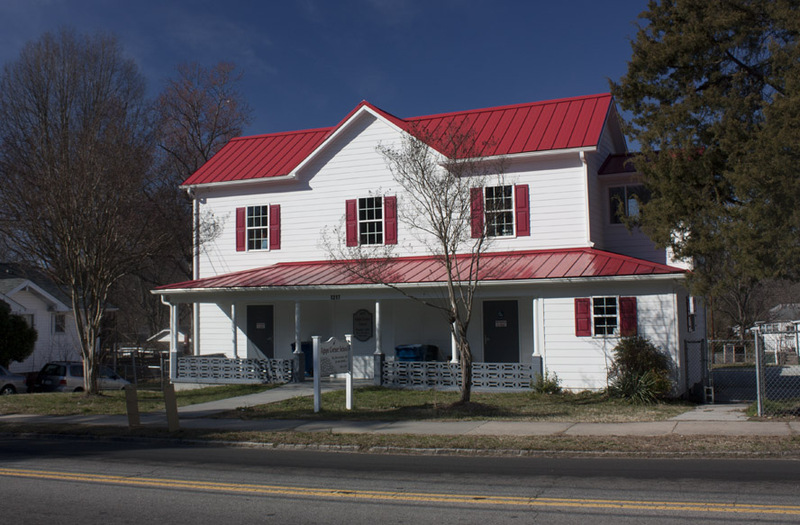 I alluded to the Agape School's recent renovation of 1217 Holloway Street in writing about their previous/original location in the Rowland-Gregory House down the block. 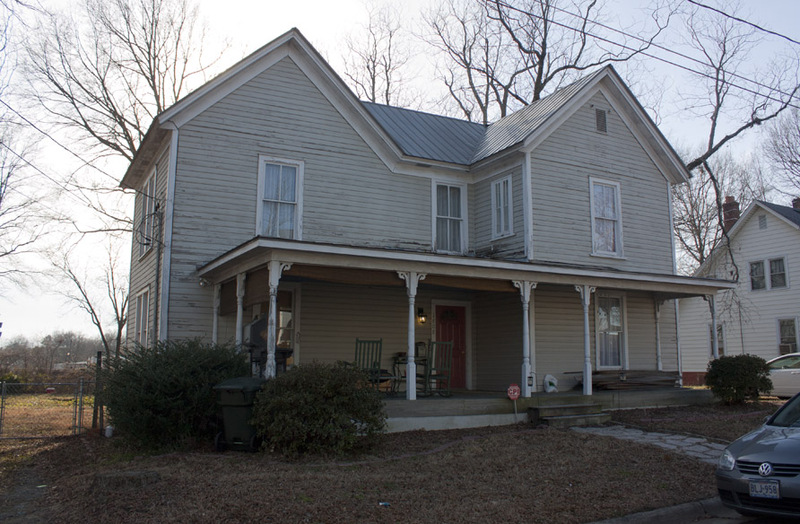 1217 Holloway appears, from its simple two-story farmhouse form, to have been an earlier structure than the more highly detailed single story houses surrounding it. 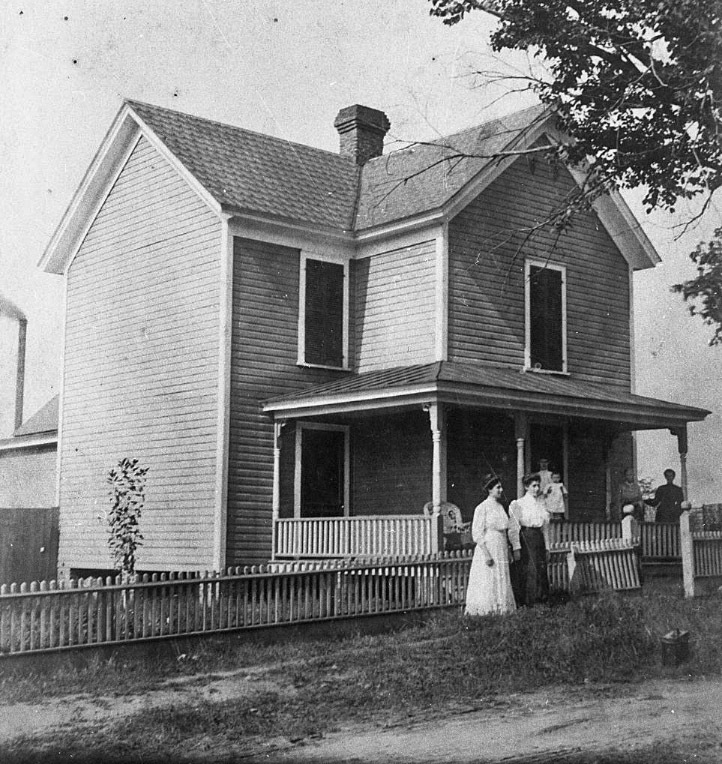 Hugh and Geneva Woods appear to have lived in the house in the 1910s, with their address listed only as "Holloway near 1st Avenue [North Driver]". Hugh appears to have died by 1919, and Geneva lived in the house until the mid 1920s. 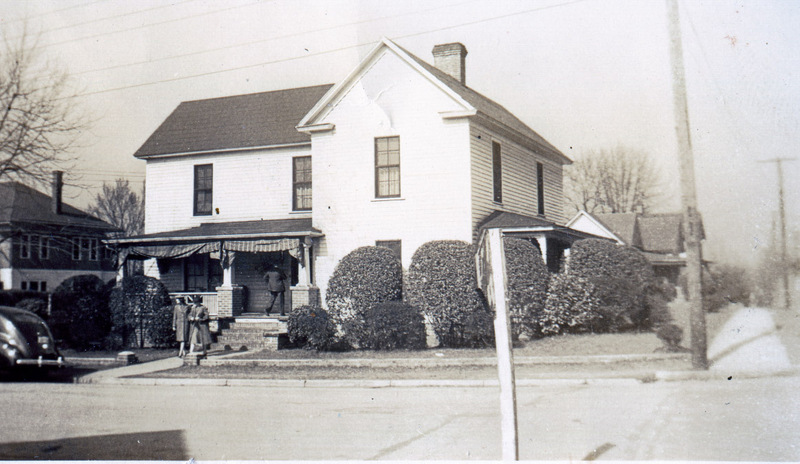 It appears to have become a rooming house or duplex after that, with Chester Carden, a carpenter, and John Taylor, a stonemason, living in the house during the 1940s and 1950s (with separate phone numbers,) occasionally with others. Two-story side-gabled I-House with a front cross-gable and a 2-story rear ell. 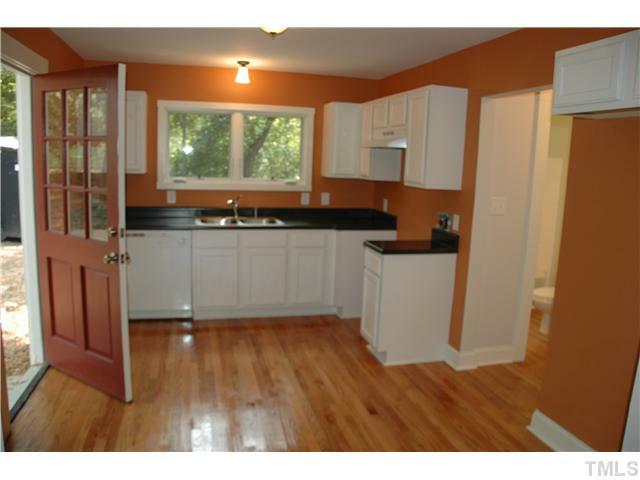 Original features are 2-over-2 sash windows and a hipped wraparound porch with Doric posts. These have been cut off and are supported with masonry blocks now. 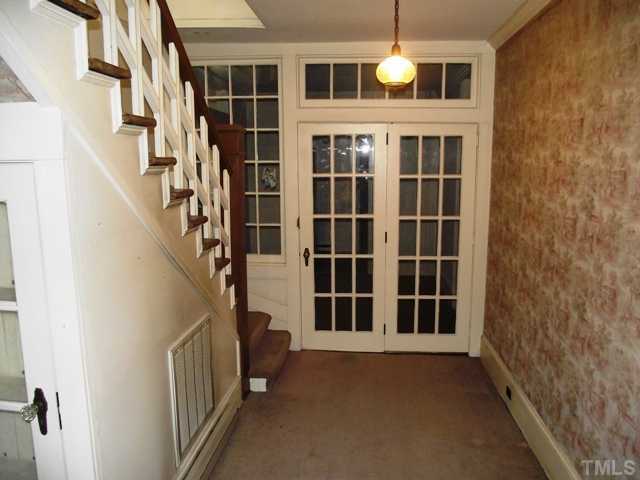 The original front door has been replaced by a window, and the comer bay of the porch is enclosed as a room. Extensive rear 1-story additions. Asbestos siding. The house is now a private school called "Agape Corner School." 1925 CD. 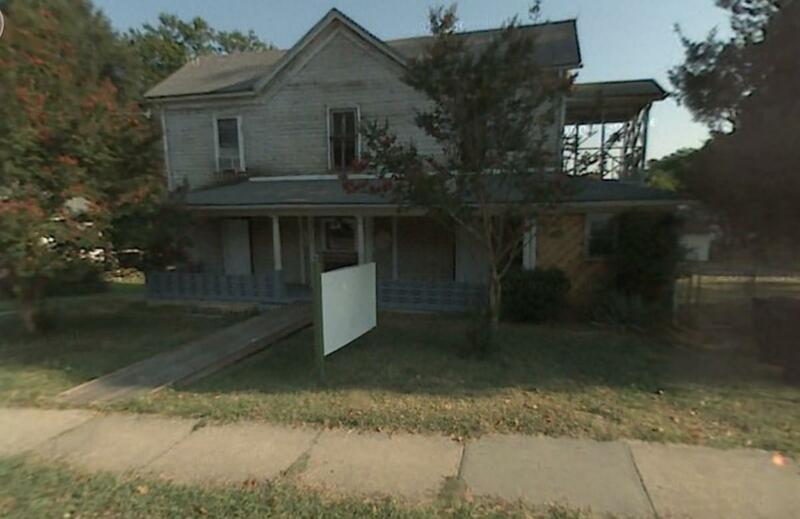 The house had deteriorated a good bit by the time Google came around in 2007. Agape appears to have bought it by this time, and began to renovate/demolish/rebuild in 2009. I suppose I should be happy that there is some semblance of the original farmhouse still standing, but I'm not, really. 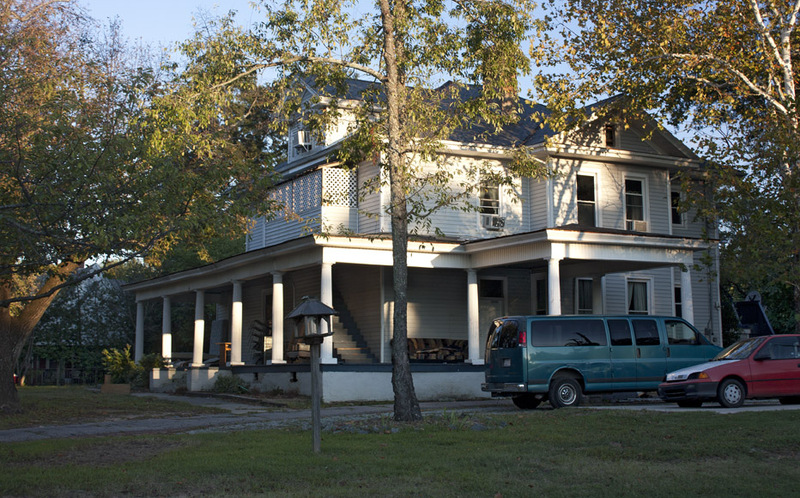 There is some of the original structure remaining behind the vinyl and lipstick, but like in much of East Durham, the original proportions and details have been wiped away with undersized replacement windows, suburban-style fake shutters, and two windowless steel doors on the front porch than inform one that the entrance is from the rear parking lot. The bright red roof isn't terrible in and of itself, but combined with the rest of the plastification, makes it look like some kind of giant toy, rather than a historic structure. The sad thing is that it could have done attractively and proportionally, for no significant cost difference, if someone simply cared enough (and was honest with themselves about their inability to make good aesthetic choices.) I mean, just call Preservation Durham or leave a comment on here. It isn't hard. 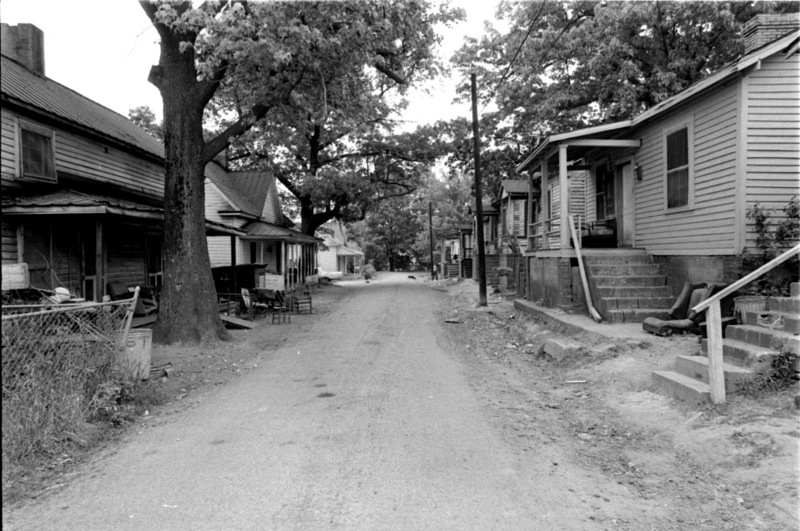 Perhaps the most infamous street in Durham, known variously as South Holman Place, Morven Place, Morven's Alley, and Marvin's Alley, began its existence as mill housing for the Commonwealth Cotton Mill. The Commonwealth was briefly revitalized as the Morven Cotton Mill in 1922, only to close again in the early 1930s. "Marvin Alley Publicity and Conditions, 01.17.49"
The more deeply I delve into Durham history, the more fascinating place it becomes. Despite repeated efforts by the powers-that-be - whether the Big Four churches downtown, the city government, or the business community - to sanitize Durham of its seamy side, it simply went further underground, and behind closed doors. Gambling houses, liquor houses, and the like proliferated on Morven's Alley. The story goes that the street was owned by the former mill, not the city, and the police weren't 'able' to patrol it. I sort of doubt that - my guess would be simply that they didn't. Loudermilk told me 'Marven's Alley' in East Durham was the inspiration for his hit song, "Tobacco Road' (see lyrics below). Keep the name "Tobacco Road"
Not much is left of Morven Place at this point - two houses. Somehow, it still felt like I shouldn't go down the street unless I was there to do business. But maybe that was just my imagination. Side-gabled 1 1/2 story bungalow with gabled dormer, German siding, eave brackets and exposed rafter tails, and 4-over-1 vertical sash windows. Shed Craftsman porch. 1930 CD. C Garage. 1930s. Front-gable garage with weatherboard and exposed rafter tails. 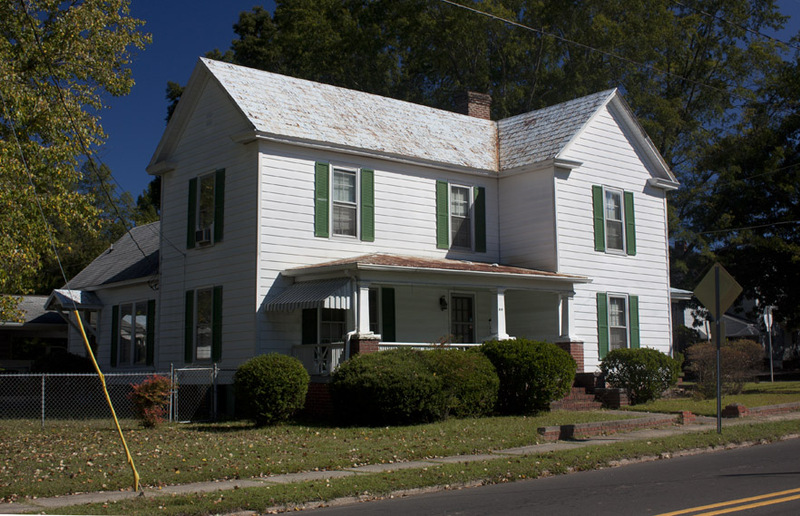 One of the oldest houses remaining in East Durham, the Cheek Farmhouse at 1805 Vale Street was once at the center of a significantly larger piece of land. 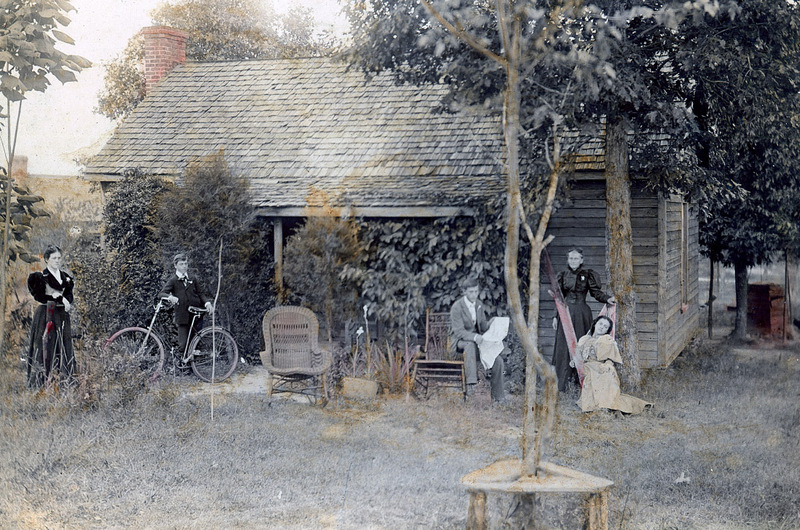 By 1905, the farmhouse and land were in the possession of Howard A. Foushee (b. 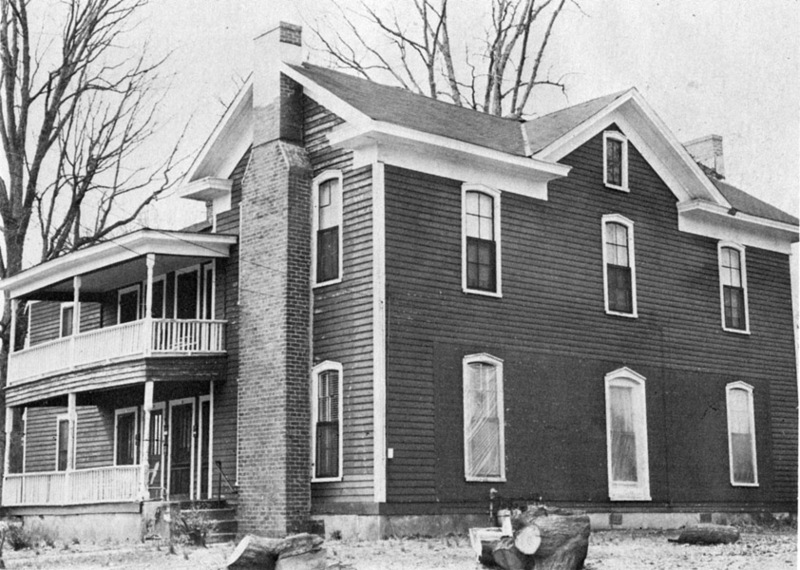 1870 - d.1916) and he subdivided the large property into building lots. The inventory surmises that the house was remodeled sometime in the early 20th century, which is consistent with some of the architectural detail that would have been inconsistent with a mid-19th century farmhouse. The house has been owner-occupied since the mid-2000s. (Below in italics is from the 2004 East Durham National Register listing; not verified for accuracy by this author. 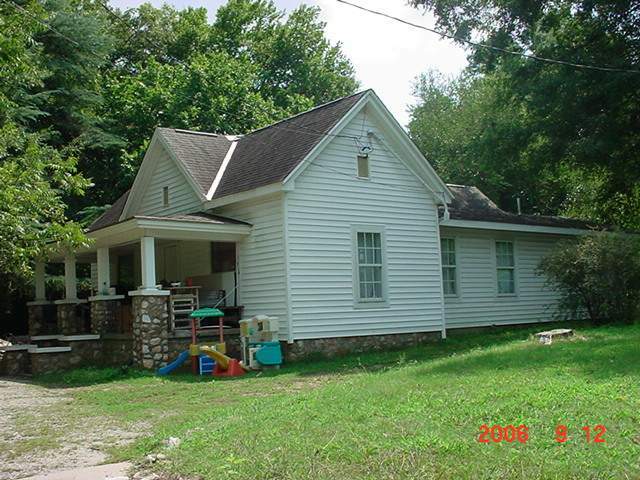 )2-story side-gable I-house with a front cross-gable with sawnwork bargeboard, German siding, and a hipped porch. Alterations include replacement sash windows and replacement turned porch posts. This property was the center of the large Cheek farm that was subdivided in 1905. J.N. 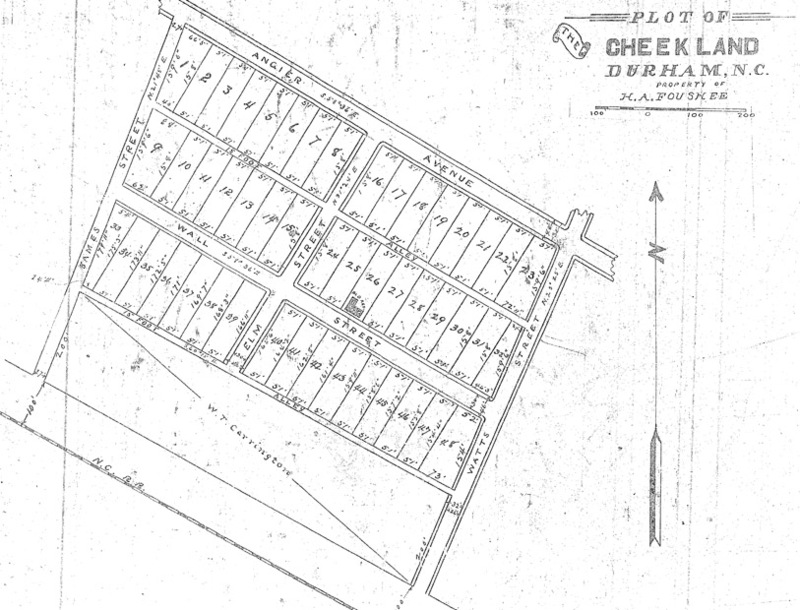 Cheek, listed in 1880s city directories as an East Durham farmer living near a cooton mill, was probably the owner. The interior contains some Greek Revival-style mid-19th century doors. 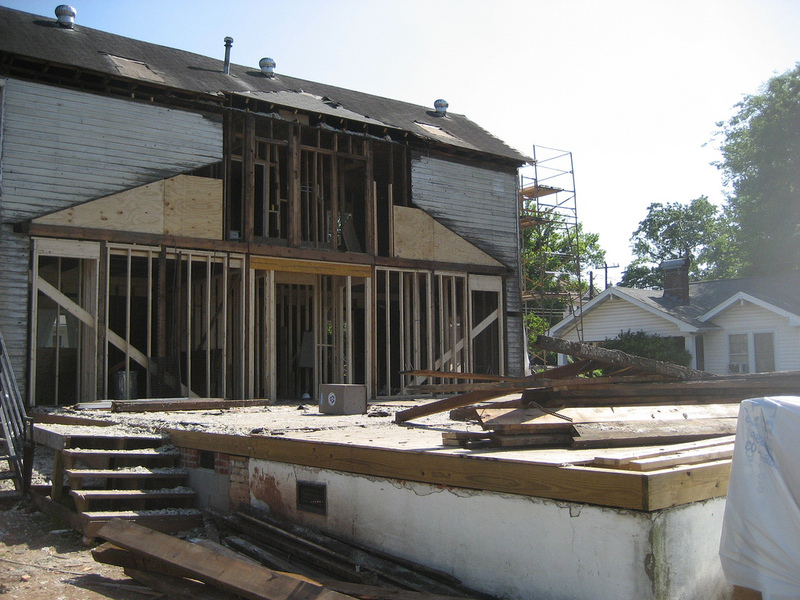 The house may have been rebuilt from an older house or the doors may have been salvaged from another house. [Roberts, Durham A & HI, 93, 1913 SM] 1930-1940 CDs: James D. Carpenter owner/occupant (boxmaker). The house received a large eastward addition, likely during the 1910s. 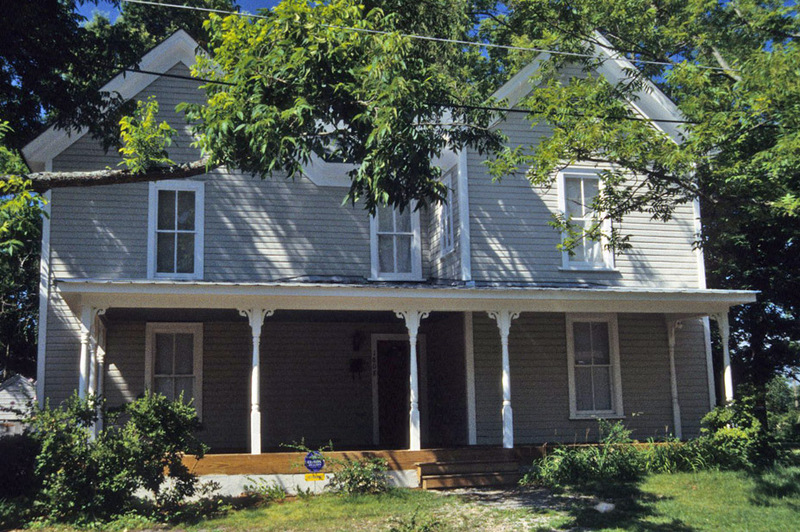 2-story gable-and-wing type house with German siding, 2-over-2 sash windows, and a full hip-roof porch with original turned posts and sawnwork brackets. 1925-1935 CDs: Eliza O'Neal occupant. 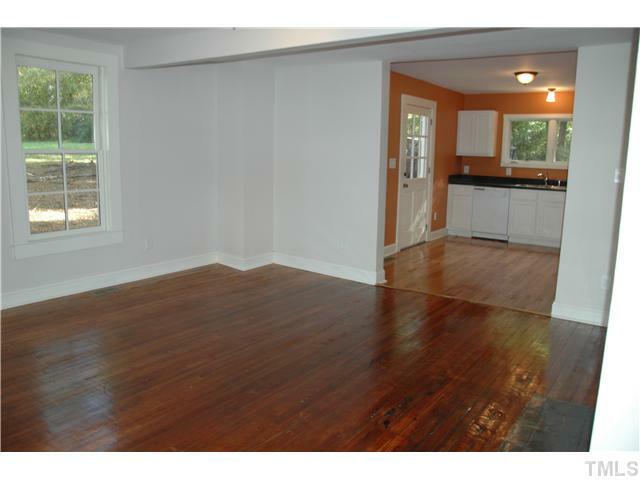 1940 CD: 2 tenants. 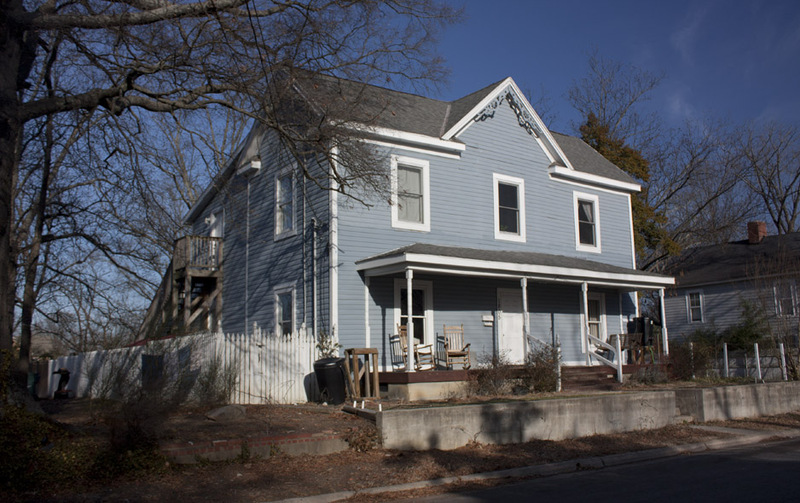 The John Marcom House is a 1-story tri-gable house with vinyl siding, replacement windows, and a hipped porch with replacement stone piers. 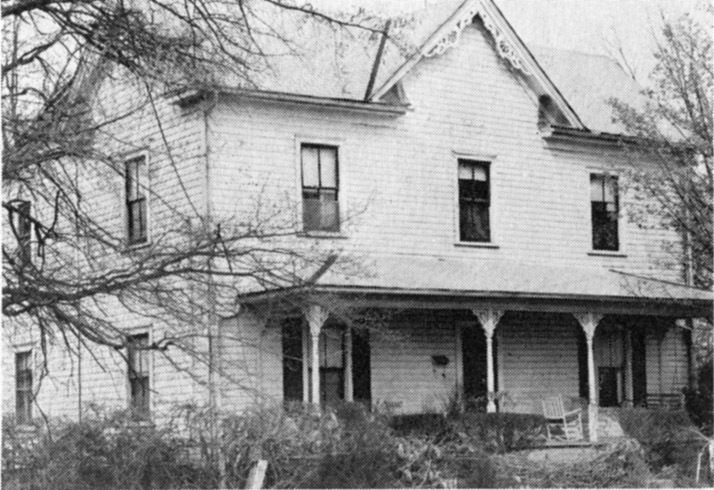 The original owner, textileworker John W. Marcom and his wife Jennie, lived here for more than half of the last century. John Marcom House. 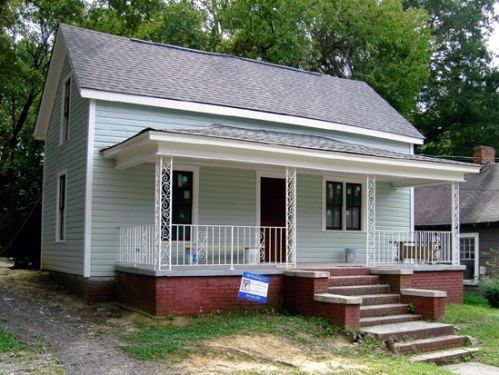 1-story tri-gable house with vinyl siding, replacement windows, and a hipped porch with replacement stone piers. The porch posts are covered with vinyl. 1913 SM. 1930-1940 CDs: John W. Marcom owner/occupant (textileworker). John W. Marcom, and later just his widow Jennie Clevie Nutt Marcom, lived in this house for almost 5 decades. John, like many of Carden Alley's residents, worked in one of the neighborhood's textile mills. Many members of the Marcom family lived within a block or two of here from the turn of the century through the 1930s, including Julius E. Marcom, and later Rosa Marcom Vickers, who at separate points in time, both lived at 1907 Carden's Alley; Walter M. and Annie Marcom at 1610 East Main Street; George and Ella Marcom at 1703 Angier Avenue; Lewis H. Marcom at 1817 Vale Street; J. Clarence Marcom at 1815 Vale Street; and J. Lewis and Hazel Marcom at 512 Bacon Street. Carden Alley/Carden Lane runs both East/West and North/South, and the numbers therefore change from 300/400s to 1900s. 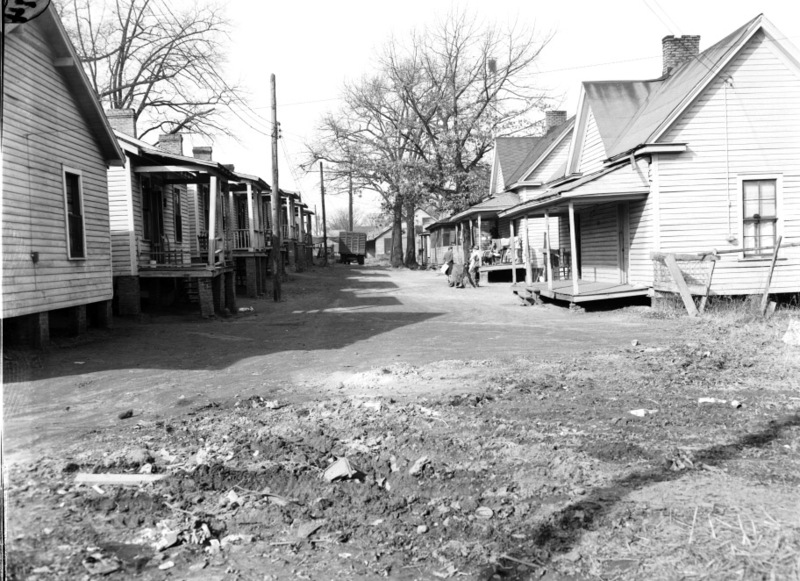 Carden's Alley was possibly named for William A. Carden who was listed as a resident on Carden's Alley in the 1917 CD. Carden's occupation was listed as "Drayman", which is nearly a non-existant profession thesedays. A drayman is someone who drives an open flatbed trucks drawn by horses to transport material. I imagine surrounded by the railyard and numerous factories that work was easy to come by for him. For other photos of of the street as well as some great memories in the comments section from past area residents, visit Gary's post on Carden Alley. 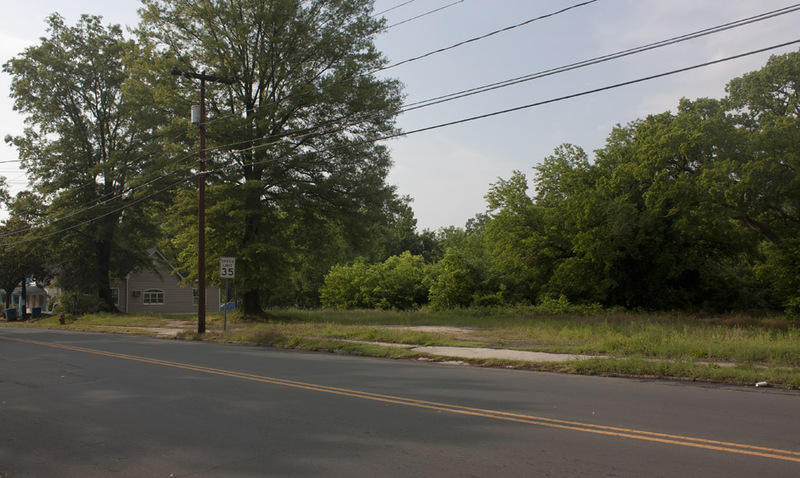 1609 Angier Ave., looking west-northwest, late 2006. 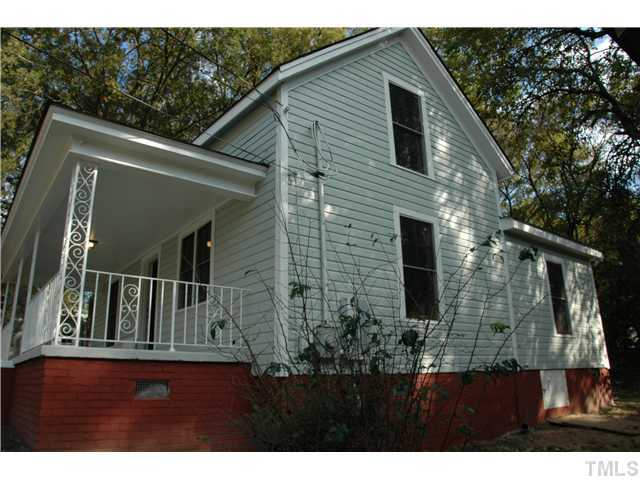 1 1/2-story side-gable house with German siding, replacement vinyl windows, and a hipped porch with replacement metal posts and railing. The form indicates that it may have been constructed as a mill worker's dwelling. 1913 SM. 1930 CD: Everett C. Johnson occupant (auto mechanic). 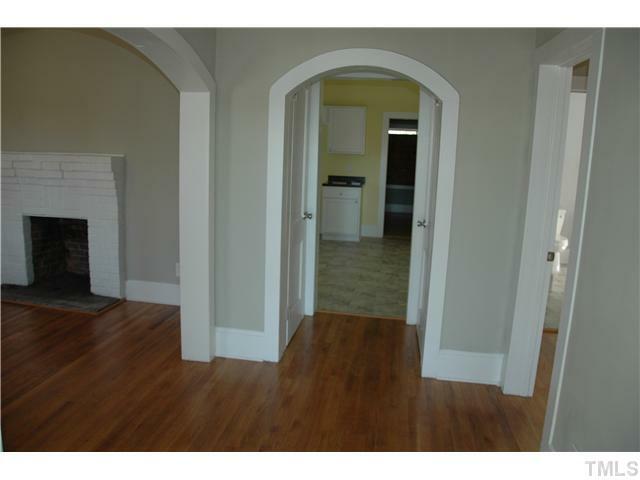 The interior features wood floors throughout, period doors, and a second floor master suite. 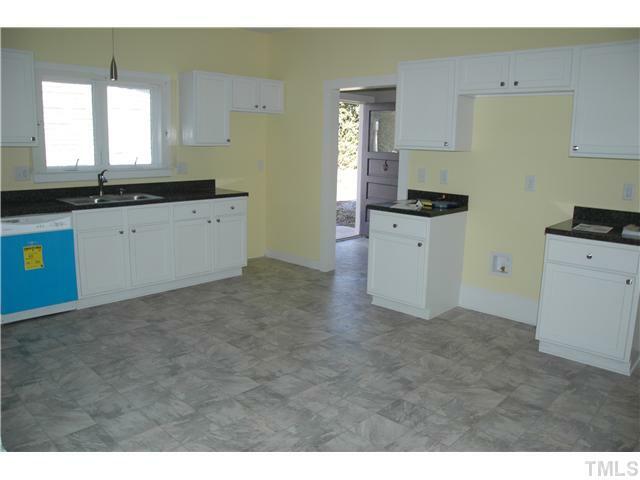 Plans include three bedrooms, two bathrooms, and a separate laundry room off the kitchen. Carpenter Thomas M. Young built this two-story T-shaped house around 1905. 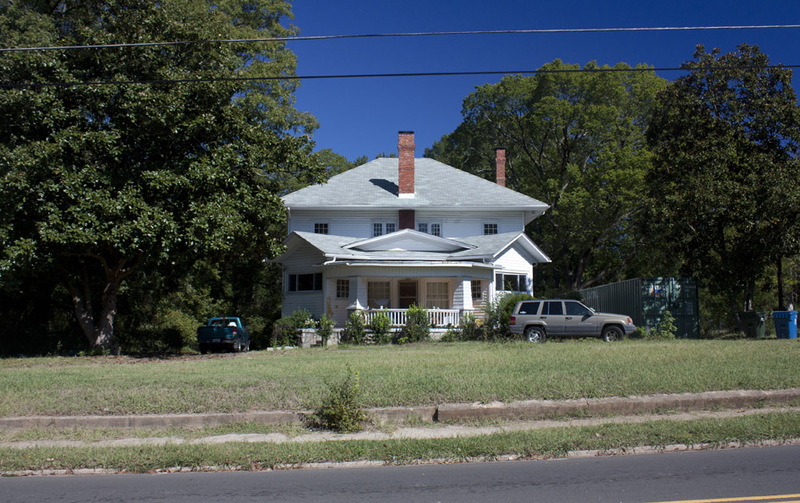 Mr. Boyd, who had been living in a house next door on South Guthrie Ave. that was constructed by Young for his daughter and her husband, purchased this house from the Young estate and moved into it in 1930 after leasing it out for a short while. 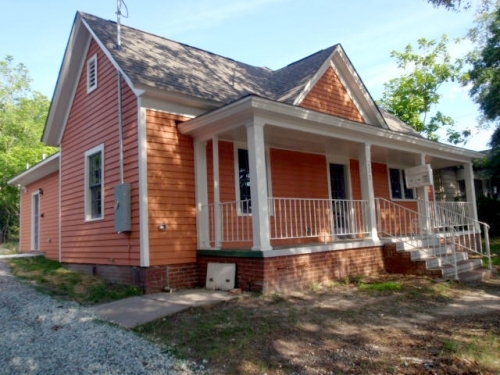 One room additions on the rear of the original house resulted in a double-pile center hall plan on the first story. The basic house type is enhanced on the interior by handsome woodworking and intricate Victorian mantelpieces with overmantels featuring rich turned ornament that reflect Mr. Young's carpentry skills. The Boyd family has continued to live in the house since the 1930s, although as of March 2011, it is for sale. Young-Boyd House. 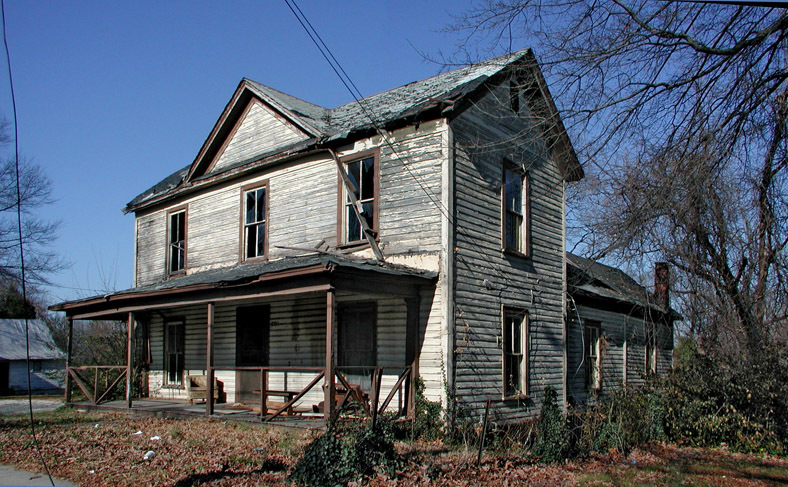 Large 2-story gable-and-wing house with a 2-story rear ell, 4-over-4 sash windows, and a 1-story porch sheltering the main block with replacement Craftsman posts. 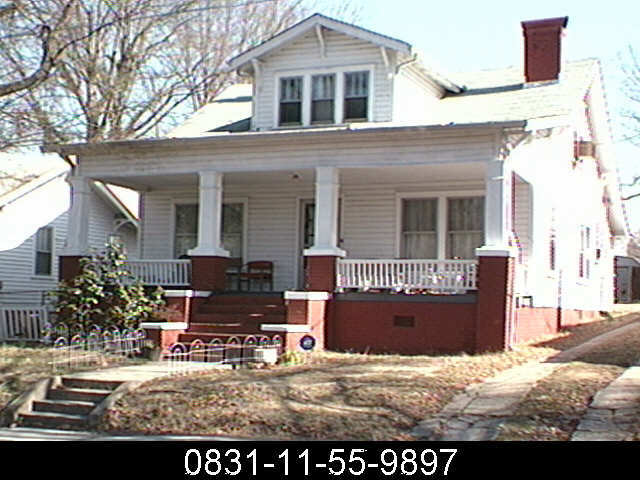 A hipped porch extends the length of the side elevation facing N. Guthrie Ave., with replacement metal posts. All-over vinyl siding. Carpenter Thomas M. Young built the house for himself. The interior contains handsome woodwork created by Mr. Young. At Mr. Young's death about 1930, M.R. Boyd, Sr., who lived next door on N. Guthrie Ave., purchased the house and lived here. His son inherited the house and was still living here in the 1980s. [Robert, Durham A&HI} 1913 SM. NC Shed/Carport . Ca. 1950, ca 1960. 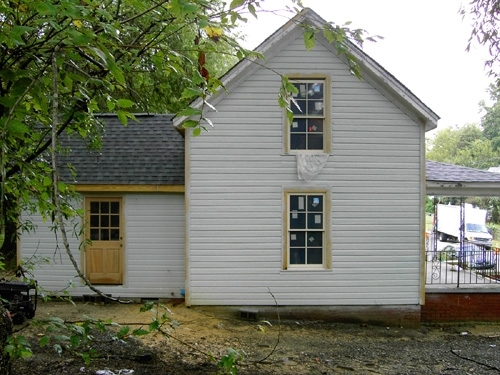 Front-gable shed with German siding connected to a front-gable vinyl-sided shed by a 2-car wooden carport. 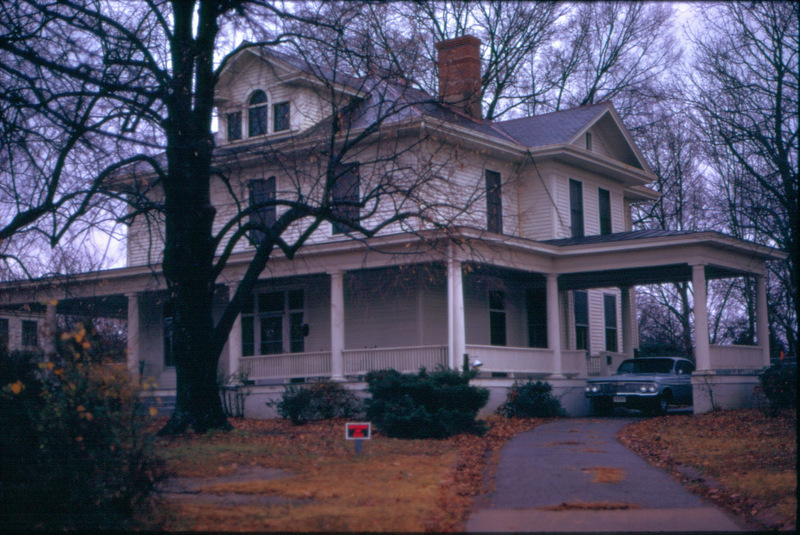 One of the more unusual early 20th century houses still standing in Durham is the Dr. George Ross house at 2111 East Main Street. 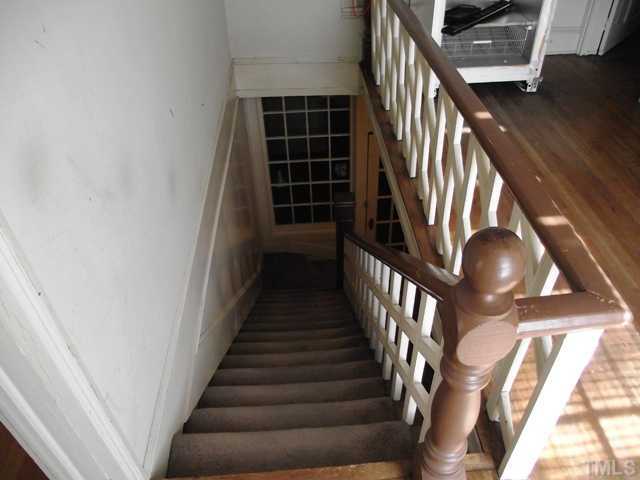 Ross lived at this location, which doubled as his medical office, from the early 20th century until his death in 1941. Ross was born in 1863 - I'm not sure when he built his original house at this location, but the house which still stands was constructed in the 1920s, replacing the original. Large 2-story Craftsman-style house with a pyramidal roof, wide boxed eaves, 9-over-1 and 12-over-1 sash windows, and an unusual center front chimney. The most unusual feature are the 1-story front wings set on the diagonal, with a connecting bowed porch. The porch has elephantine granite posts and granite steps, wood-shingled upper posts, and a weatherboarded railing. The front elevation ofthe wings have replacement sliding windows. All-over vinyl siding. A semicircular front dliveway is marked by granite entrance piers. Dr. George Ross built a house on this lot about 1905, and replaced it with this house in the 1920s. He maintained his office here. 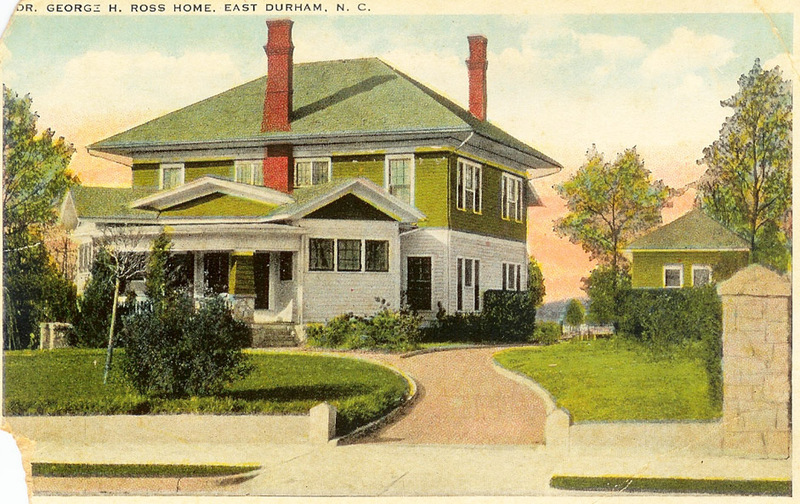 The house was a showplace of East Durham in the 1920s. In 1952, "live bait" is listed after his name in the city directory. By 1957, he shared the house with Esther Jinks, but Esther is gone by 1960. Eddie Royal and his wife Myrtle sold the property to Bobby and Patricia Holliman in 1961, who sold the house to the Gonzales family in 1997, who sold the house to the current owner in 2007. Its focal point is the one story wing on the main facade consisting of two gable-roofed wings set at angles to each other and to the main two-story double-pile block. These one-story wings are spanned by a shallow superimposed gable above a curved porch supported by elephantine piers. The porch piers, gables and second story of the main block are sheathed in split shake shingles, while the lower elevations are weatherboarded. Another unorthodox feature of the house is the very narrow exterior chimney on the main facade that pierces the deep eaves of the high hipped roof and culminates in a corbelled stack. Effusively architecturally jargony description aside, it's a wonderfully strange design. This late 19th century house constructed for [Thomas] Alford is one of the most elaborate Queen Anne style houses surviving in East Durham. 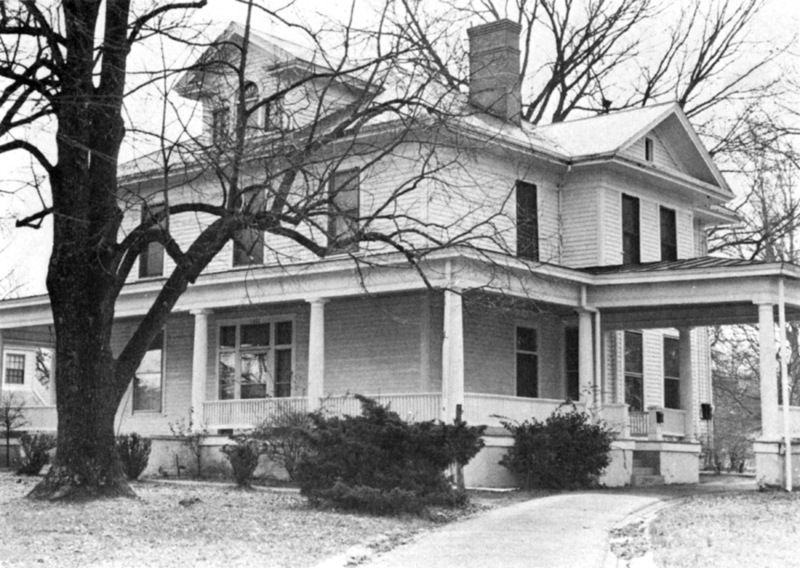 Originally, the house stood on South Guthrie Avenue directly behind the former Y.E. Smith School. It was built for Thomas H. Alford, who ran D.L. Alford and Company, a grocery and general merchandise store on South Driver Street. 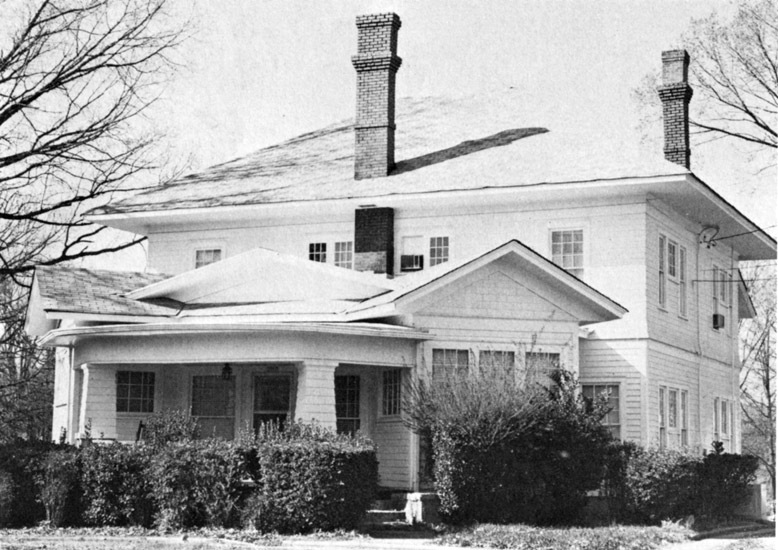 The city purchased the house in the 1930s for use by the school's home economics department. The house was moved to the present site in the 1930s to make room for additions to the rear of the school. Its vernacular ornament concentrated in the gables consists of scalloped boards and carved sunbursts supported by sawn brackets. The west gable surmounts a two-story three-sided bay and incorporates sawn drop pendant brackets at its apex. The porch posts of box pylons on brick plinths appear to be replacement supports, probably installed when the house was moved to its present site. 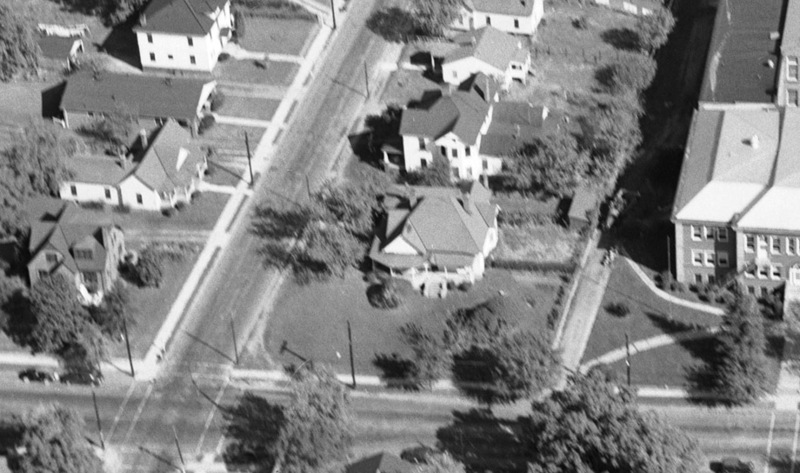 1950s aerial showing the west side of 2108 East Main before the construction of the fire station next store. The house was purchased by the current owner-occupant in 2007.